Announcement Welcome to my shop! I personally hand-make all my jewelry in my New York City studio. 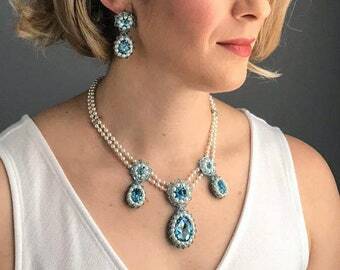 I use high quality Japanese glass seed beads and Swarovski crystals to create timeless and classic statement pieces that seamlessly transition between business and evening/weekend outfits. Welcome to my shop! I personally hand-make all my jewelry in my New York City studio. 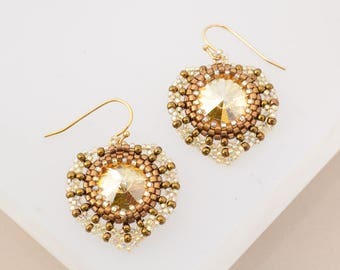 I use high quality Japanese glass seed beads and Swarovski crystals to create timeless and classic statement pieces that seamlessly transition between business and evening/weekend outfits. Beautiful work--lovely packaging--fast shipping. A great Etsy experience! Very happy with these! Absolutely beautiful! I'm wearing the new pin to work on Monday. Thank you, Andrea! 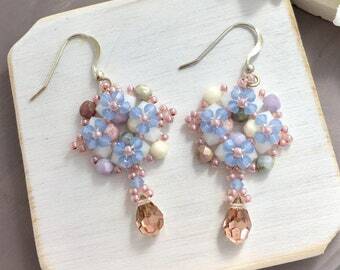 Beautifully crafted and presented earrings! Even prettier in person. Just listed in my shop! 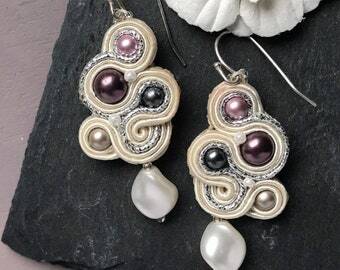 The open air windows created by this design result in a weightless and delicate pair of earrings. Just listed! 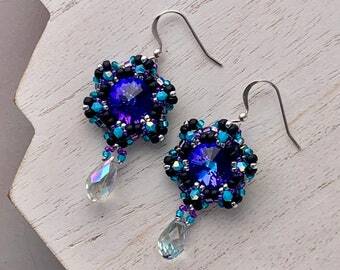 Purple and black Swarovski crystal beaded earrings. 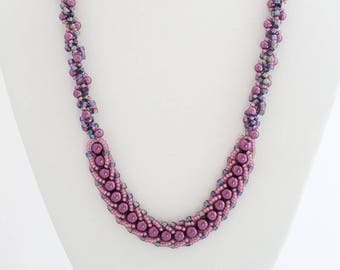 When I was nine, my family took a trip to Montana where my souvenir was several hanks of seed beads and a beading loom. I taught myself how to loom and read patterns, and took classes on all jewelry making techniques. I've continued learning from world-renowned instructors but now focus my skills on beadweaving. 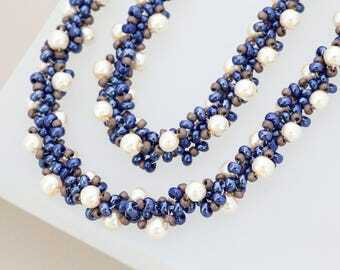 Beadweaving is like sewing with beads. 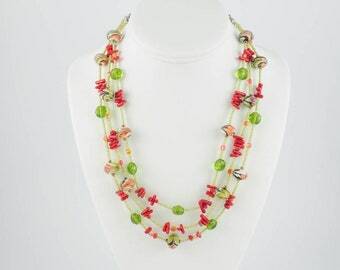 Its a way to create intricately beautiful pieces that marry colors and textures. The end result often has a pleasing tactile element that mimics fabric and drape. I ensure each piece is durable and comfortable to wear because we've all had those earrings that are so heavy we can't wait to take them off! My mom has always been an inspiration in my jewelry. At 4'11", she needs petite jewelry that is scaled in both size and weight to fit her. 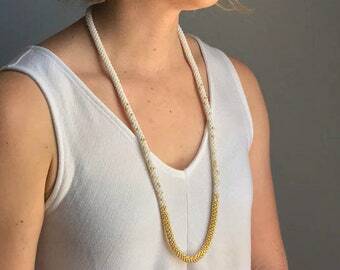 In designing pieces for her and my sister (who is 5'1"), myself (I'm 5'4") and long-time customers (who are 5'9" and over), I understand how jewelry fits differently on varying body shapes and have incorporated this in my designs. Another perspective I received from my mom is attaching emotion to each piece of jewelry. My mom received most of her jewelry on vacations or as gifts, and her jewelry box is full of memories which she's shared with me. When she would wear her jewelry, it would be a pleasant reminder of that memory in addition to a reflection of her current mood. She would coordinate her outfit around her jewelry and would never leave the house without wearing at least a necklace and earrings. Because my jewelry is meticulously stitched and crafted, each piece can take anywhere from 3-20+ hours to complete. They are unique and timeless pieces that coordinate and compliment your outfit, mood and lifestyle. I hope you enjoy wearing them as much I do making them. Welcome to my shop and thanks for stopping by! 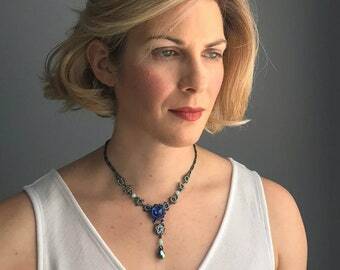 I make one-of-a-kind pieces using a variety of jewelry techniques to create comfortable and beautiful jewelry. I strive to create jewelry that will stand up to regular daily wear while being both fashionable and comfortable. If something does not meet your expectations or you are not satisfied, please convo me within 7 days of purchase and together we will determine the best course of action, be that replacement, repair or return (less shipping fees). If you do not have PayPal account you can order by credit card through PayPal, choose the PayPal option during checkout, submit your order and select "Pay Now". Then scroll down and choose the option "Credit or debit card". You don't need to sign up to use PayPal. Payment is due at the time of purchase via credit card or PayPal. Items do not ship until payment clears. Each creation is wrapped and carefully packaged in a bubble wrapper. I will ship to your Etsy address unless you convo me or make note in the Notes to Seller during check out for delivery to a different address. Unless noted in the item listing, orders will be shipped within 2 days from receipt of payment. International buyers please note that you are responsible for any and all duties and customs charges that may be incurred. I am not responsible for lost or stolen items through the mail. If you would like to insure your purchase, it is $3.50 extra for domestic mail. To insure international shipments, the order will need to be mailed by Priority shipping. Please convo me so I can adjust your order amount before purchasing. I love doing custom design work and welcome your ideas. Although my style is distinctly sparkly, I'm experienced in creating designs that reflect all color palettes and styles. 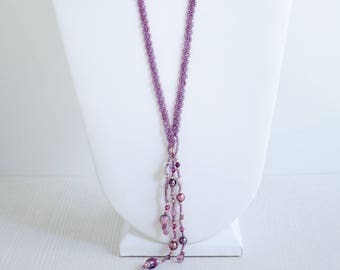 I'm skilled in all techniques of jewelry including beadweaving, bead embroidery, wire work, chain maille, and stringing. Convo me with your idea and together we'll create that jewelry piece you've always wanted! Check out my portfolio for past custom order designs. I will do whatever I can to ensure you are 100% satisfied with your purchase. If you agree, I'd greatly appreciate your positive feedback on my shop!